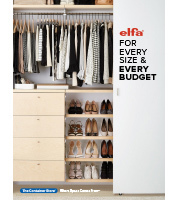 If you're trying to make the most of a small space, let Elfa maximize every square inch. Available only at The Container Store, this Platinum Elfa Closet features room for short-hanging clothes, long-hanging clothes, a stack of mesh drawers for sweaters, pants, socks and more and gliding shoe shelves for an ever-expanding collection. The fine weave of the mesh and closed corners of the drawers prevent smaller items from falling through. 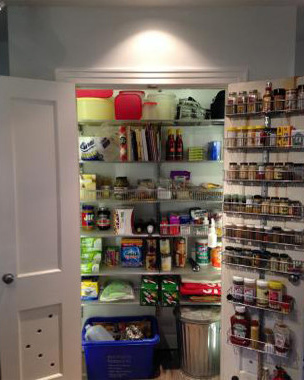 Plus, shelves above the hanging space offer a place for out-of-season clothing to be stored. This solution is designed for a 3' wide closet. If this won't work for your space, please contact us so we can design the perfect solution for you with our free service. What are the measurement in this unit?platium Ella small space unit?how deep is the rack? And how wide is the unit? In addition to the elfa closet itself, we also accessorize this space with our Ivory Huggable Hangers, Linen Laundry Hamper by Poppin, and Pandan Shirt Box (links for all accessories shown below).